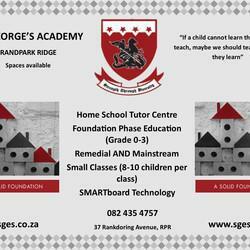 St George's Academy is an assisted learning centre. We provide specialised educational support for learners with barriers to learning. 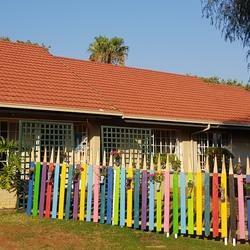 We are situated in Randpark Ridge on the border of Weltevreden Park. A solid foundation is the cornerstone of any strong structure, education being one of the most important. At St. George’s we strive to give each child a holistic and multi-sensory education in the most formative part of their schooling careers. If the fundamental principles are enforced and understood, the building blocks that will be added over the next decade will ensure your child has the best possible start to a happy and fulfilling school career. Our focus is on children who struggle to keep up within a conventional school environment. Children who are struggling with ADD/ADHD, dyslexia, dyscalculia etc. may find large classes and the workload overwhelming and they may fall behind, at St. George’s the classes are small, no more than 8 learners per class, and we provide individualised teaching based on every child’s specific needs. 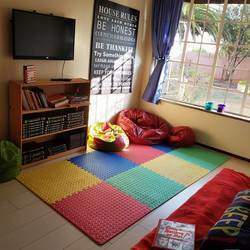 We also cater for mainstream learners who may need a smaller, calmer environment in which to mature before being reintegrated back into the mainstream environment.